Whelp, my cool bathroom sink idea didn't really pan out as I had planned. In spite of four coats of varnish on the wooden top, mildew soon appeared around the rim of the sink and tap, and slowly began to creep outwards. I put up with it for as long as I could, but finally had to admit to myself that a wooden counter in a bathroom situation wasn't going to cut it, at least in that particular configuration. Not as easy a removal as I hoped - I ended up rotating the entire counter around the pipe to unscrew the tap! Yep, looks like a clear case of mildew. Luckily Donna and I had managed to discover a tiny porcelain sink and vanity in the interim, one which would fit our space very nicely. I ordered it up and a week or so after arrival, I found the time to begin the installation. Of course, after I had already emptied our main water tank and cut off the drain to replumb it, I discovered that I had purchased a 2x2x 1 1/2" sanitary T, rather than 1 1/2" all around... I texted Donna and asked her if she could pick one up, and I decided to skip my Judo class that evening. Ahhh, another Surecraft Plastics splash guard! Good thinking! I'll just cut this right here. May as well, not ready for plumbing yet! Donna arrived home to a simple meal of various leftovers, while I set to work installing everything. Fortunately this phase of things went reasonably smoothly. Now, gluing on my nemesis - the sanitary T! Wrapping a hot towel around the poly pipe makes it much easier to remove and install fittings! With it all hooked up, less the tap (which I had decided should be the same as the kitchen - and is still on order), we pumped just enough water to fill the water line. No leaks! I then sent a bit of water down the drain. It was noisy, but again, no leaks! Kenny is confirming the no leaks policy I'm trying to implement. One change I made while redoing the drain in the bathroom - I added a P trap. The consequence of this (to my mind) would be that I would need to vent that drain. Thus I installed an air admittance valve, AAV, or cheater valve... I also plan on adding one in the kitchen, as we are getting a fair bit of gurgling and suction in the kitchen drain when the washing machine is pumping out its water. I set up a small shelf for toiletries, and managed to wrangle things so that the sawdust bucket should be able to fit under the sink and behind a door - nice to get some stuff out of sight! And stocked with toiletries already! Now we wait for the new tap and see how well it performs as a bathroom fixture too. Just a quick post here reporting in another sunny day to lift my spirits. Boiling up some water for my tea. Pulling down 46 amps, but the voltage was still climbing! Fully in absorption as I type this. I suppose if I need to put on a grey lining - our drain has been sounding funny lately, although we haven't had any water back up yet. I've been trying to pour the leftover hot water from the sauna down there just to make sure it stays open. I'll be sure to bemoan any issues that may develop. I'm not sure if I'm just weird, or perhaps there are others out there like me, but I hate putting holes in my walls unless I really, really have to. Maybe it goes back to my days as the proud and nervous owner of a sailboat, where "through-hulls" were to be avoided wherever possible, as they always presented a real danger of sinking your investment as quickly as any torpedo. In any case, it's held me back from wanting to hang much artwork in the cabin yet. I do appreciate that artwork is probably non-negotiable to many people, so in principle I didn't have anything against putting in the required hardware, but I preferred to try to keep it somehow flexible so that we could change up the art once in awhile. Probably feeding into this idea of rotating artwork is the fact that we have a child who can often become prodigious (or is it prolific? Or profligate?!) at generating master-works. Enter some leftover lattice from my sauna floor experiment! It did take a bit of digging out from under the snow, and then I sat it in the sun to dry, but fortunately that was one of my sunny days, and it dried very quickly. Nice and dry, with a hint of a wave that hopefully will smooth out over time. I first put up a piece in Kenny's room. Two cup hooks, some small binder clips, and he was set! Much nicer than when he (gasp) was using scotch tape to tape his pictures directly to his wall. Perfect for a youngster to hang up his favourite artwork! Then in the main cabin, I put up the other piece, this time with three cup hooks to ensure it could support more weight. This time I festooned it with a few small s-hooks, and then hung up our framed art and photographs. I like how it turned out. Three hooks in the wall vs. many, and it lets us easily arrange the pictures to our hearts content! Okay, okay, I know they aren't all level - this was a quick test run to see how it would look up there! Alright folks, will anyone link to this post via Pinterest? Or will I have to try to figure out how to do that myself? 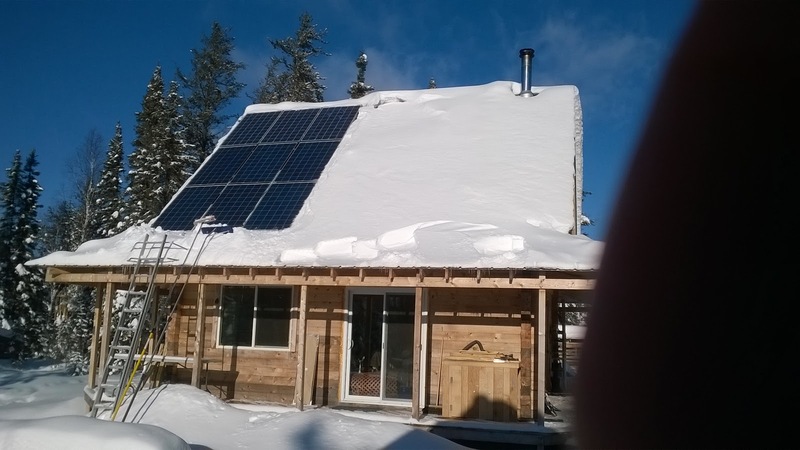 Happiness is... A Solar Panel Array Cleared of Snow! Is that my thumb in the picture?! 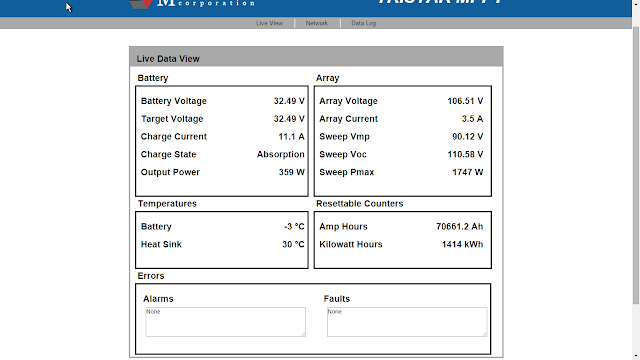 Gosh it is gratifying to have cleared solar panels... When I know that there is a few little chunks of snow or ice blocking one of my panels, I get all worked up about the (honestly significant) loss in efficiency! I sleep better knowing that these guys are all ready to go for me at the drop of any cloud cover. When we returned from southern Ontario, the panels seemed to have partially melted and then re-froze. That was much more annoying and difficult to clear than just regular fluffy snow would have been. I could sweep off most of it, but then had to rely on a sunny day to melt the remainder. It's really surprising how even at twenty below, full sun can melt snow and ice on a black background! Now, if only I could find a way to harness the power lost in that gap between Sweep Pmax and Output Power... Lithium batteries would go a long way in that department! Maybe by the time these old lead-acid ones are ready to be put out to pasture, the lithium technology will be evolved enough to make it palatable.